You can adjust the display registry settings directly using the Display Tool. The tool provides an interactive graphical interface with all the display settings supported by the display driver through registry. Note: Currently, Display Tool is supported for Colibri VFxx, iMX7x, iMX6x, Txx and Apalis iMX6x & Txx modules only. The features are further subdivided into specific configurations to provide a better understanding of the tool. BPP               Specify the bit per pixel which is used in the internal frame buffer. LDDS              Specify the number of data lines which are used to connect the display. hsp               Polarity of the Hsync signal. vsp               Polarity of the Vsync signal. pcp               Polarity of the pixel clock signal. 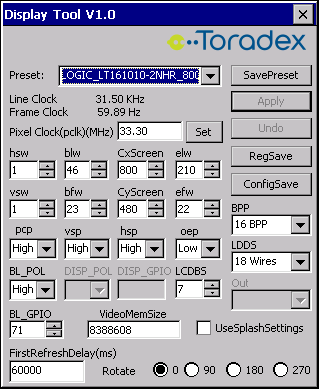 Pixel Clock(pclk) Configure the pixel clock frequency. hsw               Horizontal Sync Width. Sync setup time in clocks. blw               Beginning of Line/Beginning of Frame Pixel Clock Wait Count. (Back Porch in clocks. Yes, our "front" is the back porch). CxScreen          Here you can set the horizontal resolution of your display. elw               End of line width. Sync setup time in clocks. bfw               Beginning of frame width (Back Porch). CyScreen          Here you can set the vertical resolution of your display. efw               End of frame width. VideoRAMSize      Allocated memory for display driver in Bytes. FirstRefreshDelay Value of refresh delay. LCDBS             Display signal buffer strength. BL_GPIO           SODIMM/MXM used to turn On/Off Backlight(0 means no pin is used). BL_POL            Polarity for Backlight GPIO. DISP_POL          Display On/Off polarity . DISP_GPIO         SODIMM/MXM used to turn display On/Off(0 means no pin is used). UseSplashSettings Uses the configuration used for the splash screen. Rotate            Rotate display to according to the requirement. SavePreset        Save the current display settings to a .reg file. Preset            Select available display presets from the ComboBox. Preset file/s should be located in "DisplayPreset" folder. Application binary and "DisplayPresets" should be kept in the same directory. RegSave           Save the display settings to the Registry and save the registry to the flash memory. To get the correct range of supported values from the display driver, read the Display Driver Registry Settings article. As per the registry settings by default UseSplashSettings are enabled, to see desired changes in display driver according to the settings un-check the checkbox. For changes in display setting to take effect, reboot the module.